Opium smocking in Shanghai 1899. Home » Opium smocking in Shanghai 1899. Being satisfied, after a time, that we were not observed, we passed out through the south gate, and made our way along the tree-shaded bank of the river beside the bund, until coming to the Yang-king Pang Creek bridge, which we crossed, turning sharp off to the right and proceeding some distance before taking the fourth turning on the left, which brought us into a very disreputable neighborhood, the Seven Dials of Shanghai. Shortly afterwards we entered a second-class opium den. 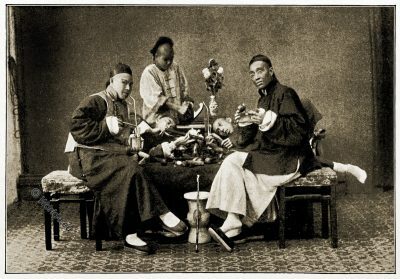 On either side of the dimly lighted rooms were rough wooden settles, each being occupied by one or two smokers who reclined on their sides, the head resting upon a small wooden or earthenware bolster, and both hands being continually employed on the flute-like bamboo pipe, one hand grasping it, and the other holding a long steel bodkin which from time to time is inserted in a small horn box containing prepared opium, a thick and sticky deep brown liquid like molasses. When sufficient opium is wound upon the end of the bodkin, he holds it over a little lamp by his side, turning it continually, and at intervals kneading it against the flat covered-bowl of the pipe until sufficiently heated, when he places the opium, about the size of a pea, upon the minute aperture which enters the hollow bowl, taking care to puncture a small air-hole through the opium into the pipe. He then places it to his lips and inhales the smoke, drawing fast and furiously for a few seconds, and then recommencing to fill it again, during which process he leisurely emits the smoke through mouth and nostrils, and so on until satisfied. Many people wrongly suppose that, after smoking opium, a man becomes half or completely stupefied. Quite the reverse; the opium seems to have a stimulating influence; and when a man feels tired, he smokes a few pipes of opium, and rises refreshed and invigorated. If, however, he has finished his day’s work, he invariably indulges in a few extra pipes, perhaps with a friend, and, after a pleasant chat, bids him good night, and, retiring to his couch, gradually falls into a comfortable sleep. Of course if he smokes too much, which is more the exception than the rule, it makes him somewhat drowsy and he sleeps heavier. But the ethereal, De-Quincey-like visions which are supposed to enhance his slumbers are only familiar to western romancers. When a poor coolie wants a smoke he goes into one of these divans, lays down two or three cents (thirty cash), perhaps more if he can afford it, and receives a proportionate amount of prepared opium, generally held in a small shell, and a pipe, both of which he returns to the proprietor before leaving. The price of opium varies greatly, according to quality, from 8 to 18 dollars a pound. The native opium grown in China, is generally considered the most inferior, and the Indian opium, especially Malwa and Patna, the best. through the long outward-curving stem that is always adorned with knotted silken cords and beaded tassels. The tubular bowl, being so small, only holds sufficient tobacco for two or at the most three whiffs, at the expiration of which it is drawn out and cleaned by blowing through the lower end; and the half-smoked contents, falling on the ground, generally burn a little black cavity there. You may always know when Chinese have tenanted a house by the floors being covered with these little black dents— typical endorsements of their refinement— incomparable with the “barbarity” of Western nations. 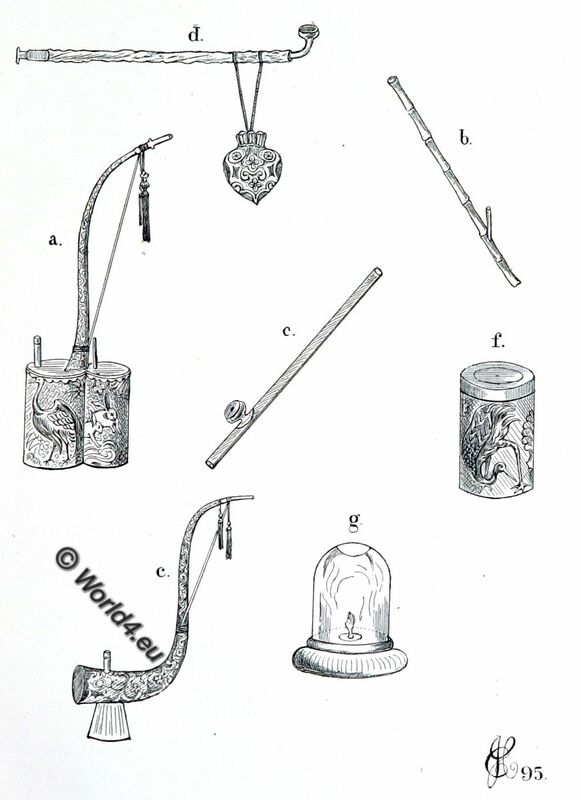 The poorer classes who cannot afford to buy metal hubblebubble pipes make bamboo ones, or merely use the ordinary long, short, crooked, or straight stemmed pipes, perhaps ornamented with an embroidered tobacco-bag dangling from the stem, and fitted with glass mouth-piece. These pipes, like all the rest, have tiny brass bowls, which hold barely a pinch of tobacco, and require constant filling with tobacco which smokes like chaff, emits a peculiarly unpleasant aroma, has an uncommonly nauseating flavor, and possesses the undeniable virtues of being fine, light, and above all, cheap, and entirely different in every respect from ours. Source: The Mystic Flowery Land by Charles J. H. Halcombe. Being a True Account of an Englishman’s Travels and Adventures in China. Publishers to the India Office. Luzac & Co., London 1899. This entry was posted in 1899, 19th Century, Asia, China and tagged China scenery, Colonialism, Historical Chinese costumes on 9/20/17 by world4.